sugar and spice, not necessarily in that order…. Are people getting married any more? Of course they are, but I’m in that phase of life where more people are having babies than are getting married. Don’t get me wrong, I love babies, but I miss having a wedding every month. I do love them! A great excuse to get dressed up, knowing that for this night these people who I care about are not only promising to love each other through thick and thin, but they are going to celebrate it with (most) everyone they love? Perfection! Just a couple of weeks ago, my dearest friend and I were lamenting the lack of weddings recently. It really is quite a tragedy. I am, however, guilty as charged, as my wedding really only had family. I’m sorry to all my friends that I deprived of the wedding experience (so far; we do plan to have a bigger party at some point, but life keeps getting in the way. Maybe we need to start thinking about a 5 year plan…)! Imagine my delight when I peered into my calendar for the next couple of months and realized that we have a wedding to go to each month! 🙂 Hurray! I have justification to buy new shoes! 🙂 I’m partly kidding, of course. 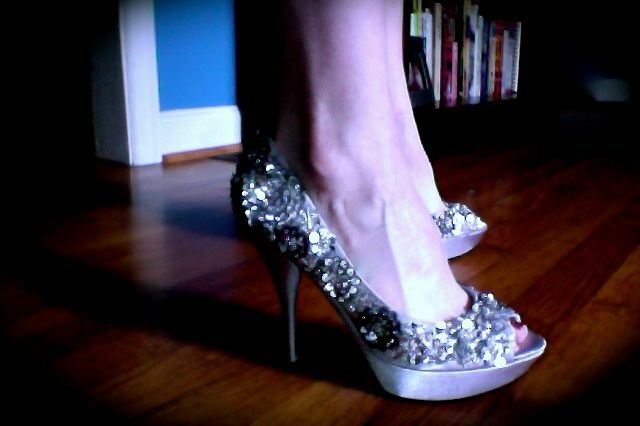 For the first wedding, I’m standing up in it, and we were just encouraged to wear silver shoes. And, if I’m being honest, I do have several pairs of silver shoes. At least a couple of them probably could have done a very good job of carrying me down the aisle. And then, I found out that they were available in silver! 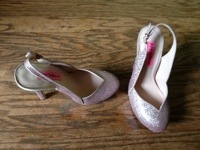 I will confess, however, that I don’t love them as much in silver as I do in pink. I do still love them, though, and I love having them on my feet! I stalled in indecision for a few days, and procrastinated myself right out of ordering them from my go-to shoe site, Zappos (they ran out of my size). I became increasingly alarmed as I cruised the internet shopping outlets I frequent for shoes as the Zappos situation repeated itself several times! Uh oh, tension mounting! Fortunately for me, when it comes to shoes, there are few as tenacious as I am! 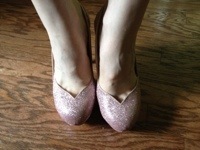 Not only did I find the Sadi’s in silver, I found them at a better deal than they were on Zappos. Amazon! 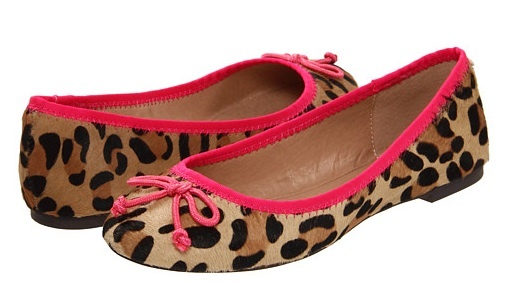 For shoes!! Who knew?!? My feet are all dressed up, with nowhere to go! After our yard got all pretty yesterday, I’ve definitely had floral on the brain! (And shopping, but that doesn’t really have anything to do with our yard!) In any case, here are a few of the items I’ve found in light of my recent inspiration! Mike: Have you picked out your shoes yet? Me: I don’t have anything to wear. Mike: I’m not sure I believe you. Me: It’s completely true. I’m not sure what I am going to do! Mike: I’m note sure I believe you. Me: I have to go shopping. So… here I am, scrambling to shop online at lunch. 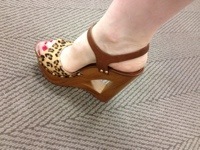 It is a rare privilege that I am accompanied on a shoe shopping trip by my husband. In truth, this was an unplanned shopping expedition and one on which I did not expect (indeed, expected NOT) to purchase anything, but nonetheless, I found myself shopping with my sweet and very tolerant husband yesterday. Oh happy day! Even better, he found a pair of shoes I fell hard for. And if he picked them, I pretty much have to get them, right?? Who are you calling a Naughty Monkey?! A little while ago, a friend of mine was getting married, and another of our friends needed to go shopping for the occasion. I was more than happy to volunteer as her shopping wing-woman! I had never been, er, shopping with my friend Kelly, and thus was a smidge surprised when she suggested that we go to Nordstrom. I mean, don’t get me wrong, she was classy and all that, its just not where most of my friends start their shopping. Lo and behold, my friend Kelly has a personal shopper at Nordstrom who has been a part of her wardrobing for almost 10 years! Can you believe it? Well, I couldn’t. I mean, I did, but… The personal shopper apparently felt the need to entertain me, too, and how could I object?! I didn’t… at all! 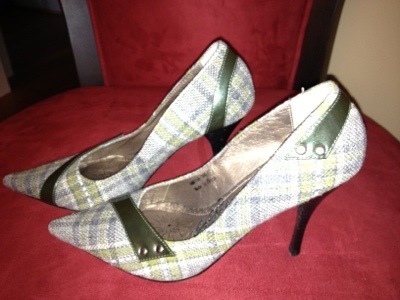 These lovely ladies are by Naughty Monkey, and have paired nicely with khaki, black, and white. 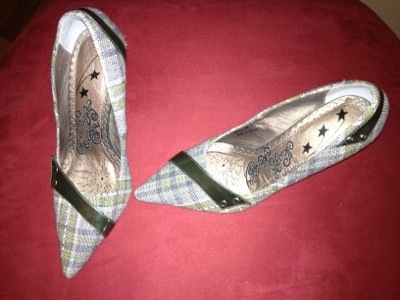 And, I’d like to think that they are on-trend with the plaid phase that is going around (its only a small stretch!). 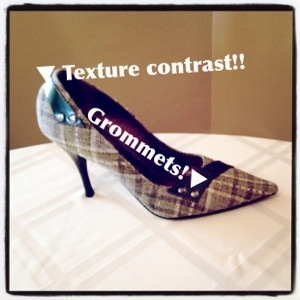 I love that these shoes are both sophisticated and unexpected! I’ve never been one to shop for a label. The style of the item… ok the shoe… sometimes the color, and sometimes the number of straps have always been key factors in my shopping decisions. My mother pointed out a long time ago that the more bows, straps, or buckles a shoe has, the more likely I am to feel like I need them. It is also true, however, that I have had favorite brands. I’ve gone through my Nine West phase, and my Steve Madden phase, and my Naughty Monkey phase. I remember, early in elementary school, when it was the cool thing to do to have a wide variety of high-top Reeboks (I’m not sure if this was a widespread trend or if it was localized to my small suburban elementary school). I had red, green, white, black, and my favorites were a bright royal blue. I guess its time to admit it… I’m a life-long shoe-aholic. 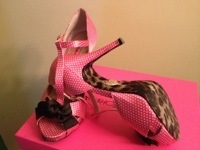 the full monte: straps, polkas, bows, and peep toes! a pair of shoes that I came across in my mindless internet shopping (some people read to fall asleep, while others leave the tv on; me? I browse the internet’s multitude of shopping sites. Sad, I know), and while I did end up buying them, I still smile every single time I even think of them! 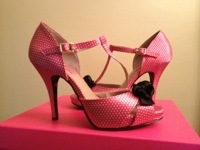 They are very fun: polka dots, bows, t-straps, peep toes – all the good things, rolled in to one fabulous shoe. Sparkles and a sweetheart toeline!